HappyOrNot, the company responsible for creating the globally-recognizable ‘Smiley’ feedback system, releases its newest product Smiley Wall™, a lightweight, peel-and-stick version of its classic Smiley Terminal. Building on the success of its previous products – with over 25,000 Smiley Terminals and Smiley Touches installed around the world and having collected over 900 million feedbacks to date – the Smiley Wall empowers companies to collect customer feedback without placement limitations. The Smiley Wall is the ultimate “place anywhere, space saver”. Compact and completely wireless, its peel-and-stick functionality enables companies to place it exactly where it is needed most and fits best. All-in-one – The survey question is printed on a changeable faceplate, making it a perfect all-in-one solution for capturing feedback in any area, while retaining critical floor space. Peel-and-stick – Double-sided, industrial grade stickers enables companies to place it precisely, and firmly, where needed. This also makes relocating it hassle-free. Accessibility – The all-in-one feature allows precise placement on the wall – higher or lower, depending on the desired accessibility – giving companies the ability to cater to their customer bases’ specific needs. 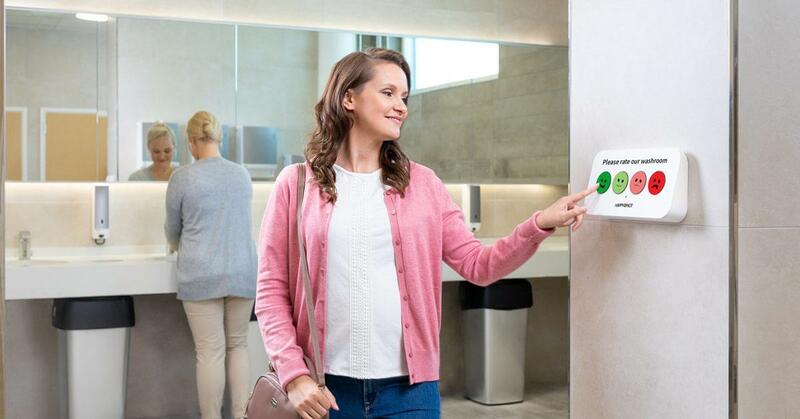 Organizations in the sectors of facility management, airport, restaurants, or hospitals and clinics can greatly benefit from the precise placement capability of these terminals. In August, TLV, a passengers’ transport and ferry service in France, trialed 17 Smiley Walls on eight of their ships to gauge passenger satisfaction. Fabien Vincent, the CEO of TLV, tells about the decision: “When we are talking about renewing an existing contract or signing a new one we need to be able to demonstrate that we are providing good service every day and with a significant sample rate. HappyOrNot works very well for us and helps us to show that to the buyers. The announcement of the new products and services means that organizations will be given even more detailed access to, and analytics for, extensive customer or employee data, allowing them to apply scientific rigour (rather than hunch-based logic) to implement management and HR decisions. Now, even minor changes to a company’s service or structure can be evaluated, with management teams able to directly monitor changes in satisfaction levels to correlate customer happiness with sales. HappyOrNot was founded by Heikki Väänänen and Ville Levaniemi in 2009. The company currently has over 4,000 clients in 117 countries (and a global reseller network of over 110 companies), and has recorded over half a billion responses to date. The company currently employs over 100 people across its HQ in Tampere, Finland and US office in Florida. Its clients include Microsoft, McDonald’s, London Heathrow Airport, LinkedIn and the British National Health Service (NHS). In 2017, The Financial Times listed HappyOrNot in the top quartile of the FT1000 Europe’s Fastest Growing Companies. In October 2017, HappyOrNot raised $14.5 million in a Series A round of funding led by leading venture capital firm Northzone (early Spotify investor) and Airtree.